The 3rd International Exercise-Associated Hyponatremia (EAH) Consensus Development Conference convened in Carlsbad, California, in February 2015, with a panel of 17 international experts. The delegates represented four countries and nine medical and scientific subspecialties pertaining to athletic training, exercise physiology, sports medicine, water/sodium metabolism and body fluid homoeostasis. The primary goal of the panel was to review the existing data on EAH and update the 2008 Consensus Statement.1 This document serves to replace the 2nd International EAH Consensus Development Conference Statement and launch an educational campaign designed to address the morbidity and mortality associated with a preventable and treatable fluid imbalance. The following statement is a summary of the data synthesised by the 2015 EAH Consensus Panel and represents an evolution of the most current knowledge on EAH. This document will summarise the most current information on the prevalence, aetiology, diagnosis, treatment and prevention of EAH for medical personnel, athletes, athletic trainers and the greater public. The EAH Consensus Panel strove to clearly articulate what we agreed on, did not agree on and did not know, including minority viewpoints that were supported by clinical experience and experimental data. Further updates will be necessary to: (1) remain current with our understanding and (2) critically assess the effectiveness of our present recommendations. Suggestions for future research and educational strategies to reduce the incidence and prevalence of EAH are provided at the end of the document; areas of controversy that remain in this topic have also been outlined. The 3rd International EAH Consensus Development Conference utilised National Institutes of Health guidelines, amended for a more holistic approach to fit the needs of both the group and the topic. Twenty-two individuals (17 accepted) were invited to participate in the consensus conference who: (1) have made scientific and/or clinical contributions to the topic of water and sodium homoeostasis, and/or hyponatraemia; and (2) represented a specific group (eg, nephrology, endurance medicine, etc) or had unique topical expertise (eg, cystic fibrosis (CF), muscle cramps, fluid balance, etc). The present document is intended to serve as the scientific record of the conference with intent to widely disseminate this information to achieve maximum impact on both current healthcare practice and future medical research. The methodology governing the conduct of this consensus development conference is summarised below. A broad-based expert panel was assembled. Panel members included researchers and clinicians in endocrinology (JGV), nephrology (MHR), emergency medicine (IRR), family medicine (WOR, JMW and DPL), internal medicine (AJS), physical medicine and rehabilitation (MDH), sports medicine (WOR, JMW and DPL), athletic training (SF-G and KCM) and exercise physiology (JPD, SF-G, TH-B, MDH, RJM, SJM, NJR and KJS). Workgroups were created 3 months prior to the February 2015 meeting to update the following EAH target areas: epidemiology, aetiology and pathophysiology, diagnosis, treatment and prevention. Each workgroup was asked to present updated drafts for discussion during the closed session. A systematic, comprehensive and updated literature review was shared by the panel members prior to the February 2015 meeting, using a cloud storage service that was organised into workgroup categories (epidemiology, aetiology and pathophysiology, diagnosis, treatment and prevention). All panel members had unlimited access to the cloud storage service and could add digital versions of published manuscripts to the EAH manuscript section at any time. The panel chairperson (MHR) was responsible for monitoring the progress of each work group, directing the closed session and guiding the panel's deliberations. Using the previous two EAH consensus statements as a starting point, each work group was asked to: (1) incorporate new data into each assigned section and (2) update any outdated information. All recommendations were graded based on clinical strength, using the grading scale described by the American College of Chest Physicians (table 1).2 Particular emphasis was placed on creating more generalised recommendations so as to prevent and treat EAH across a wider variety of athletic events, rather than the endurance sports focus of the two prior EAH Consensus Statements. The travel (except RJM and IRR, who supported their own travel), hotel and meal expenses for the participants were funded by CrossFit, Inc. The open conference was also sponsored by CrossFit, Inc. However, no members from CrossFit, Inc, participated in any of the closed discussions or contributed to the development of the consensus guidelines. Furthermore, no members from CrossFit, Inc, had access to the consensus document prior to publication. The vast majority of recreationally active individuals begin endurance races with a blood [Na+] above 135 mmol/L. Based on data pooled from 27 separate studies, encompassing 2262 participants with a verifiable pre-race blood [Na+] measurement, only 0.8% (19/2262) presented with hyponatraemia prior to race start.9–35 These pooled data represent blood [Na+] measurements collected in seven countries and between 5 min to 72 h precompetition. This 0.8% also includes 16 questionable below-normal [Na+] values possibly confounded by fingerstick haemolysis29 and/or outdated techniques.25 Thus, baseline (pre-event) hyponatraemia in recreational exercisers appears to fall within the expected range for a normal population distribution (1–2%), and at a frequency well below what has been observed in individuals presenting for non-hyponatraemia-related clinical treatment situations36 or in hospitalised patients.37 We thereby believe that EAH largely develops during or immediately following exercise. EAH can present in two forms: asymptomatic or symptomatic. Asymptomatic athletes with [Na+] <135 mmol/L have largely been detected by blood samples taken post-exercise from athletes participating in research protocols or obtained for reasons other than suspicion of EAH. Athletes with the symptomatic form of EAH can present with mild, non-specific symptoms (eg, lightheadedness, nausea) but typically present with headache, vomiting and/or altered mental status (eg, confusion, seizure) resulting from cerebral oedema (termed EAH encephalopathy or EAHE) that may38–48 or may not49–52 be associated with non-cardiogenic pulmonary oedema. EAHE is a life-threatening condition that has been observed across a wide variety of activities (box 1). The incidence of asymptomatic and symptomatic cases of EAH varies widely with regard to type and duration of activity, location of the event, characteristics of the participants (see risk factors) and heat or cold stress during the event. Symptomatic EAH is rare and occurs with considerably less frequency than asymptomatic EAH, but complications associated with EAH have led to at least 14 athlete-related deaths since 1981.28 ,38 ,47 ,50 ,61–69 Symptomatic EAH generally occurs as an isolated case or in small clusters during or following endurance events, with participants reporting to the race medical facilities or to hospital emergency departments within 24 h after participation. In general, participants seek treatment for a constellation of symptoms ranging from feeling unwell to convulsions. Clusters of cases have occurred in military training exercises, marathons, Ironman triathlons and ultramarathons. The incidence of symptomatic EAH has been reported to be as high as 23%57 and 38%70 of athletes seeking medical care in an Ironman triathlon and an ultramarathon, respectively, but most endurance events report no cases of symptomatic EAH, especially at the marathon distance and below. Two studies have examined large compilations of data to help define the incidence of symptomatic and asymptomatic EAH.55 ,71 In the first study of 2135 athletes from eight endurance events ranging in length from 42.2 to 161 km,71 the incidence of symptomatic EAH was 1% (compared to 6% with asymptomatic EAH) among study participants. In the second study of 669 161 km ultramarathon runners,55 ,72 only one case (0.1% among study participants) of symptomatic EAH presented during the 5-year sampling period (compared to 13% with asymptomatic EAH), but considering the total number of race participants over this time period, the actual incidence of symptomatic EAH was approximately 0.06%. Symptomatic EAH has also been reported in hikers73–75 and military personnel.75–77 Symptomatic EAH accounted for 16% of Grand Canyon hikers seeking medical care for exercise-associated collapse or exhaustion from 31 May to 31 September 1993, providing an estimated incidence rate between 2 and 4 per 100 000 persons.73 ,78 Furthermore, suspected hyponatraemia was found to account for 19% of non-fatal suspected heat-related incidents in the Grand Canyon National Park from April to September during 2004 to 2009 hiking seasons.74 In the US active duty military, the annual incidence rate of hyponatraemia from 1999 to 2012 has ranged from approximately 4 to 13 cases per 100 000 person-years (averaged 6.7 cases per 100 000 person-years).77 However, this incidence is probably inflated, as the data were derived from a medical-coded database that does not have a specific designation for EAH and likely includes hyponatraemia from exercise-related as well as non-exercise-related conditions. Alarmingly, symptomatic EAH is now being reported in a more diverse set of sporting activities. For instance, symptomatic EAH has been reported in shorter distance endurance competitions, such as a half marathon79 with slower finishers completing the distance in 2–3 h and a sprint triathlon with slower finishers taking approximately 2 h to complete.80 In addition, EAH has been reported in US professional and college American rules football players,40 ,41 and has led to the deaths of three US high school football players between 2008 and 2014.63 ,64 ,69 Symptomatic hyponatraemia has also been reported in a 48-year-old lawn bowler who was heterozygous for the Delta F508 CF mutation, although it is unclear if complete genetic analysis for all possible CF mutations was performed,81 as well as in a 34-year-old woman following a Bikram Yoga session82 and in a 39-year-old woman following a 2 h workout including tennis and weightlifting.83 Cases of symptomatic EAH have also been induced in two separate laboratory studies involving low-intensity exercise conducted in high ambient temperatures.84 ,85 Deaths from symptomatic EAH have occurred in a 25-year-old male police officer participating in a 19 km bicycle training ride68 and at least partially contributed to a case of fraternity hazing involving a male pledge performing callisthenics.67 It is likely that other cases of symptomatic hyponatraemia have either not been recognised or not been reported. There is a paucity of evidence suggesting that those developing symptomatic EAH have either been a ‘salty sweater’99 ,105 or a heterozygous carrier of the CF genotype.106 Athletes with homozygous CF, however, are at risk for developing hyponatraemia, as demonstrated by numerous instances when an individual is diagnosed with CF after the development of hyponatraemia during prolonged physical exertion105 ,107 or prolonged exposure to high ambient temperatures.108–110 As individuals with CF experience a longer lifespan (median predicted survival age in 2012 was 41.1 years111) and are encouraged to consider exercise as one of their therapies,112 this population may be at increased risk for EAH due to the combination of high sweat fluid and sweat [Na+] loss. Symptoms associated with EAH are due to osmotically induced shifts of water into the intracellular compartment. In the confined space of the cranium, these shifts of water into the central nervous system (CNS) tissues lead to cellular oedema and pathological increases in intracranial pressure. Acutely, this may manifest in symptoms previously described, and in the extreme, may lead to brain stem herniation and death. Summary statement: The primary aetiology and pathophysiological mechanism underlying EAH—and all known fatalities—is the overconsumption of hypotonic fluids relative to exchangeable sodium likely in combination with non-osmotic AVP secretion (Grade 1A). There is persisting debate as to the relative contribution of under-replaced sodium losses to the lowered sodium concentrations observed in EAH. While in clinical medicine, electrolyte depletion without expansion of total body water or hypovolaemic hyponatraemia is well described,5 ,6 ,135–138 in EAH this variant has been more difficult to define and is much less likely to be encountered except in extreme events usually over prolonged periods (such as ultramarathons),139 or hot Ironman distance triathlons.19 ,20 The data regarding sodium losses during exercise (as measured during recovery) and their potential contribution to the development of symptomatic hyponatraemia in longer and hotter races,139 have been consolidated in table 2 against data collected from relatively shorter and cooler races123 ,140 ,141 where fluid overload hyponatraemia has been verified. From the standpoint of the clinical literature, hypovolaemic hyponatraemia reflects a loss of total body exchangeable sodium that manifests as volume depletion.5 ,6 ,135 ,142 ,143 Hypovolaemic EAH would be predicted89 to occur in athletes exercising for longer periods of time (such as 161 km ultramarathons; >20 h),11 ,54 ,55 ,56 and/or in hotter11 ,19 ,20 ,55 ,108 ,109 environments, and/or with higher sweat sodium losses.99 ,101 Clinical confirmation of the hypovolaemic form of hyponatraemia is supported by a spot urine sodium concentration (U[Na+]) below 30 mmol/L136 ,137 ,144 in conjunction with a serum or plasma [Na+] below 135 mmol/L. A spot U[Na+] <30 mmol/L is 100% specific and 80% sensitive for predicting a sustained increase (>5 mmol/L) in serum [Na+] following isotonic saline administration136 in clinical patients. Elevated blood urea nitrogen levels (>20 mg/dL)136 ,139 and weight loss19 ,20 ,55 may also suggest volume depletion as a pathogenic contributor to EAH. However, these biochemical tests are not always available at the point of care and thus clinical assessment (vital signs, weight change and physical examination) may be the only indication of volume depletion. Summary statement: Under-replaced sodium losses contribute to serum [Na+] independent of distance (Grade 1A). However, there is a paucity of data supporting sodium loss as the primary mechanism of symptomatic EAH even in those who exercise for prolonged periods of time and in warm weather (Grade 2C). In these cases, relative overdrinking of hypotonic fluids with sustained non-osmotic AVP secretion is likely involved in the development of symptomatic EAH. Since drinking fluid volume above sweat and urinary losses during and after activity is the main pathophysiological mechanism underlying asymptomatic, symptomatic and fatal cases of EAH, prevention is dependent on drinking less. Thirst should provide adequate stimulus for preventing excess dehydration and markedly reduce the risk of developing EAH in all sports. Physiologically driven thirst has been defined as a “generalised, deep-seated feeling of desire for water,”145 and is an evolutionarily conserved, finely tuned regulatory mechanism serving to protect both plasma osmolality and circulating plasma volume.146 Osmoreceptors (highly vascularised structures located around the third and fourth ventricles, and characterised by the lack of a blood–brain barrier; they are points of communication between the blood, the brain parenchyma and the cerebral spinal fluid) located within the circumventricular organs of the brain and baroreceptors located within the aortic arch, carotid sinus and great veins provide ‘real-time’ neural input to higher centres of the brain, which continuously and simultaneously coordinate the regulation of both thirst and AVP secretion. Thus, there are physiological sensing mechanisms in place to prompt when to drink and therefore guard against excessive dehydration. Earlier published recommendations to begin drinking before thirst were largely meant for situations where sweating rates were high, above maximal rates of gastric emptying, and dehydration would rapidly accrue over time. 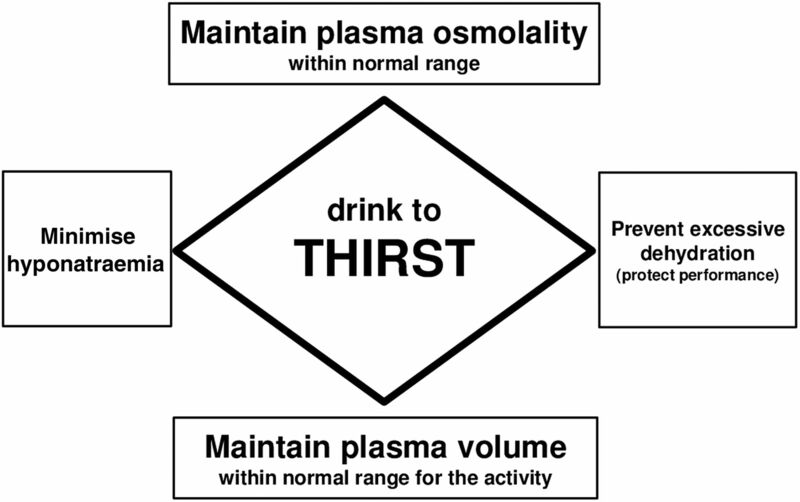 Unfortunately, this advice has fostered the misconception that thirst is a poor guide to fluid replacement, and has facilitated inadvertent overdrinking and pathological dilutional EAH. The diagnosis of EAH is made when the blood, serum or plasma [Na+] is below the normal reference range of the laboratory performing the test (typically <135 mmol/L), and is associated with a typical clinical constellation of symptoms and signs. In our collective experience, EAH is best classified by clinical severity (symptoms) and not the absolute numerical [Na+] value to best guide treatment strategies. Asymptomatic EAH represents a biochemical finding, diagnosed by blood electrolyte testing for research or unrelated metabolic screening purposes.10 ,15 ,18 ,19 ,28 ,30 ,32 ,53–59 This group of participants presents without any discernable symptoms, or may have mild, generalised and transient symptoms commonly experienced by other participants who do not typically seek medical care following exercise. In normally distributed populations, up to 5% of all athletes tested would fall outside of the normal range for [Na+], with half of those (2.5%) falling in the range of asymptomatic EAH values. Mildly symptomatic EAH typically presents with non-specific signs and symptoms without clear signs of encephalopathy (box 3). Athletes with mild EAH may have normal vital signs and may not have any orthostatic hypotension; also, the symptoms do not resolve after placing athletes in the Trendelenburg position,147 as would be expected with exercise-associated postural hypotension.148 The clinical symptoms of mild symptomatic EAH are not specific or sensitive, but should raise the index of suspicion for EAH and necessitate a low threshold for [Na+] measurement, as athletes can rapidly progress from mild symptoms to severe and life-threatening EAHE (box 3). Severe symptomatic EAH is characterised by neurological signs and symptoms due to cerebral oedema that occur when water flows along the osmotic gradient from the extracellular fluid into the intracellular compartment (box 2).38–52 ,152 Severe symptomatic EAH may38–48 or may not49–52 be accompanied by the respiratory distress of CNS-triggered non-cardiogenic pulmonary oedema (box 3). EAHE is a life-threatening condition that requires urgent intervention and should be evaluated with an immediate [Na+] measurement if available. Summary statement: EAH can present with a wide range of symptoms ranging from non-specific mild symptoms to severe encephalopathy. The severity of symptoms and not the absolute value of the [Na+] should guide the choice of therapy (Grade 1A). Rapid determination of [Na+] is critical in confirming clinical suspicion but may not always be available. Any athlete exhibiting signs or symptoms consistent with acute hyponatraemia (box 3) should be screened for EAH. The capacity for onsite [Na+] analysis is optimal for management of EAH and is recommended for any large-scale endurance event. However, this capability is not always practical or possible (eg, small or remote events).118 ,151 Treatment should be based on the degree of neurological impairment, not simply the [Na+] level;5 ,6 as brain oedema is dependent on both the magnitude and rate of fall of [Na+], not just the lowest level reached, as stated previously. The following treatment protocols are recommended for EAH and EAHE based either on [Na+] measurement and clinic assessment or clinical assessment alone if [Na+] measurement is not available. Although there is no compelling reason to actively treat asymptomatic EAH, it is clinically appropriate to administer oral hypertonic saline (HTS) solutions to reduce the risk of progression to symptomatic hyponatraemia;139 ,155 this is particularly relevant for those with a [Na+] <130 mmol/L. On departure from the event site, athletes with asymptomatic EAH should be advised to seek urgent medical attention if any neurological signs or symptoms of EAH develop within 24 h after event completion, since delayed-onset symptomatic EAH may frequently occur.40 ,42 ,46 ,52 ,72 ,80 ,82 ,91 ,100 ,122 ,156 Ideally, an athlete with asymptomatic EAH should have a companion on discharge from the medical area to observe the affected athlete for signs and symptoms of evolving EAH, since the neurological impairments associated with EAH may limit the athlete's ability to accurately self-assess his or her own status. Summary statement: The major clinical relevance of asymptomatic EAH lies in its potential for asymptomatic athletes to quickly transition and progress into symptomatic stages if hypotonic fluids are given intravenously or ingested (Grade 1C). Thus, in patients identified with EAH, hypotonic or isotonic fluids should be withheld until urination is documented (Grade 1C). Any athlete with EAH associated with signs or symptoms of encephalopathy should be immediately treated with an intravenous bolus or infusion of HTS to acutely reduce brain oedema, with additional intravenous boluses administered until there is clinical improvement42 ,51 ,72 (box 4). The dose and route of HTS administration should be based on the severity of clinical symptoms and the available HTS formulations, as discussed in box 4. Numerous case reports and case series have validated the efficacy and safety of intravenous HTS administration in symptomatic EAH,8 ,38 ,48 ,49 ,52 ,62 ,72 ,82 ,91 ,100 ,122 ,154 with one runner receiving 950 mL of 3% over a 7 h period without complications42 and a swimmer receiving 40 mL of 20% HTS51 without complication. ▸ Comparable amounts of more concentrated Na+-containing solutions (eg, 10 mL of 20% NaCl; 50 mL of 8.4% NaHCO3) may be used as an alternative to 3% NaCl. ▸ In some situations (ie, more severe encephalopathic symptomatology such as seizures, coma or signs of impending brain herniation), it may be appropriate to administer larger HTS boluses initially rather than waiting to assess clinical improvement after repeated smaller boluses. The goal of this therapy is to stabilise the athlete for transfer to an advanced medical care facility for further evaluation, monitoring and treatment. Ideally, the athlete should be transported with knowledgeable medical personnel from the event who are able to maintain the same level of care en route and to ensure that the treatment is not interrupted for evaluation such as CT of the brain or treatments that may worsen hyponatraemia, such as administration of hypotonic fluids, lactated Ringer's, or isotonic (normal) saline. The diagnosis of EAH or EAHE must be communicated to the receiving physician on transfer of care. Summary statement: For those athletes presenting with signs and symptoms consistent with EAHE, emergent intravenous treatment therapy with HTS is indicated and should not be delayed pending laboratory measurement or other diagnostic testing (Grade 1B). Any athlete with mild EAH symptoms (box 4) may be treated with an intravenous bolus of HTS as described above. Alternatively, a mildly symptomatic athlete may be treated with oral hypertonic solutions when tolerated,139 ,155 ,160 (box 4) or observation until urination, as seen in clinical settings.6 ,120 Oral sodium tablets may not be as efficacious as hypertonic solutions, as suggested in a single case report,124 and requires further investigation. The efficacy and tolerance of oral HTS has been supported by limited field studies,139 ,155 and may offer practical advantages in some settings (eg, where intravenous HTS or intravenous access is not available). In contrast to athletes with severe EAH, those with mild symptoms may be discharged from onsite medical care once symptoms have resolved and spontaneous urination has occurred. Repeat measurement of [Na+] is generally not required unless the patient has persistent symptoms after the initial treatment. As is recommended for asymptomatic EAH, on departure from the event site, athletes should be advised to seek urgent medical attention if any signs or symptoms of EAH develop after discharge, and ideally should have a companion capable of monitoring for signs and symptoms of which the athlete may not be aware. Summary statement: Athletes presenting with mild symptoms associated with EAH can be treated with an intravenous bolus of HTS (Grade 1B), oral HTS fluids or observation until the onset of urination, as dictated by clinical symptoms (Grade 2B). Summary statement: Athletes presenting to a medical facility with EAH should be treated as per other settings (Grade 1C). However, diagnostic testing in these scenarios should not delay potentially life-saving therapy with HTS (Grade 1C). Athletes and support crews need to carefully consider fluid and electrolyte supplementation during and after exercise, and the rationale behind those decisions. Excessive fluid replacement beyond thirst (whether water, sports drinks or other hypotonic fluids) is not a panacea for all instances of fatigue, collapse, muscle cramping or exertional heat stroke (table 3). The drinking of fluid volumes sufficiently above sweat and urinary losses before, during and after activity, resulting in the accrual of a positive water balance, is the primary underlying pathophysiological mechanism of symptomatic and fatal EAH cases.34 ,41 ,45 ,52 ,57 ,58 ,61 ,71 ,73 ,75 ,76 ,84 ,119 ,122–126 ,161 ,162 Therefore, prevention strategies must target drinking behaviour. Fluid intake recommendations suggesting that athletes begin to drink fluids before the onset of the sensation of thirst were targeting those exercising in situations where high sweat rates were present and dehydration could evolve rapidly, with known medical and performance outcomes. Unfortunately, this advice fostered the misconception that thirst is a poor guide to fluid replacement in lower sweat rate situations. We believe that this has facilitated individuals choosing to inadvertently adopt overdrinking and develop pathological dilutional EAH, as demonstrated in 41 cases evaluated in table 3. Modest to moderate levels of dehydration are tolerable and pose little risk to life in otherwise healthy individuals. Laboratory and field studies indicate that fluid deficits less than and up to a volume approximately equal to 3% of normal body mass (or ∼5% total body water) can be tolerated without a reduction in endurance performance or muscular power when in cool to temperate (−10°C to 20°C) temperatures.163 Therefore, aggressive drinking to prevent dehydration is unnecessary and carries with it greater risk of developing symptomatic EAH. Body weight is a reasonable surrogate measure of hydration state when measured day to day after sleep,164 and can be used to relatively accurately assess changes in hydration state accompanying upwards to 1–2 h of activity. However, it is a very imprecise measure during those athletic events where EAH is most likely to develop, that is, multiple hours of sustained activity. This is in large part due to body mass changes accompanying energy combustion128 and unknown amounts of food consumed, bathroom stops, etc. Moreover, consolidation of four studies (786 athletes) comparing body weight changes taken at registration (1–3 days prior) and again within 60 min of race start demonstrate an average of 1% increase in body weight9 ,10 ,12 ,165 from registration to race start. However, this average value conceals the fact that large gains in weight (up to at least 4% of body mass)165 ,166 occur in some individuals while substantial weight losses occur in others over the last day or two before competition. This weight increase further confounds the accuracy of bodyweight as a proxy measure of body water in field events. With that said, a body mass measured after several hours of activity that is equal to or above the individuals’ normal body mass, is a positive indicator for the presence of fluid overload. Primary recommended fluid intake strategy to prevent symptomatic exercise-associated hyponatraemia (EAH). Summary statement: Given that excessive fluid consumption is a primary aetiological factor in EAH, using the innate thirst mechanism to guide fluid consumption is a strategy that should limit drinking in excess and reduce the risk of developing hyponatraemia while providing sufficient fluid to prevent excessive dehydration (Grade 1C). Summary statement: Sodium supplementation is a strategy for attenuating sodium concentration reductions that can develop when fluid intakes approximate sweat losses during prolonged exercise but cannot prevent EAH in the setting of a persistent excessive fluid intake that produces fluid overload (Grade 1C). Past studies have demonstrated that cycling fluid stations placed 20 km apart in an Ironman triathlon and running fluid stations placed 5 km apart in a standard marathon have reduced or prevented EAH.53 ,179 However, this proposed strategy and its effect on the incidence of EAH needs further study to determine the optimal number and spacing of fluid stations in different terrains and ambient temperatures. Furthermore, alternative strategies will be needed in settings where EAH has been noted but aid stations are not provided, or in situations where drinks are freely available and/or athletes transport their own fluids. Athletes who seek more quantitative guidance are encouraged to weigh themselves before and after training to assess their sweating rates and fluid replacement needs. Some weight loss associated with activity will be unrelated to fluid status, as non-water mass is lost as energy is expended (approximately 0.23–0.24 g/kcal),128 ,182 and is increased with increasing duration and intensity of exercise.128 The presence of weight gain is a positive indicator that fluid intake has been in excess of fluid losses and water overload is present. Summary statement: Educational efforts regarding the risks of overhydration should be encouraged and disseminated widely to athletes, coaches and event management personnel (Grade 1C). These efforts should include all sporting events where EAH has been encountered. Event management strategies such as limiting access to fluids may be of benefit, but require broader study. Educational strategies and programmes are needed that effectively communicate to coaches, athletes and parents: rational fluid replacement, avoidance of overconsuming fluids (water, sports drinks or other hypotonic fluids), to recognise the signs and symptoms of EAH, and to understand the critical need for immediate medical attention for suspected casualties. Athletes, coaches and parents must be alert to the risks of excessive fluid consumption and understand that high fluid intakes will not necessarily prevent exercise-associated maladies such as muscle cramps or exertional heat stroke. The educational strategies for on-site medical personnel must address the circumstances (during or following events or practices during acclimatisation), identification, evaluation and management of EAH and EAHE, and emphasise that the life-threatening nature of these rare conditions requires immediate intervention. The pathophysiology of EAH and the drinking behaviours involved in the evolution of EAH must be clearly recognised. It should be stressed that: (1) EAH is caused primarily by the consumption of hypotonic fluid in excess of sweat and urinary losses and (2) excessive fluid intake (water, sports drinks or other hypotonic beverages) may not prevent muscle cramps or exertional heat stroke and, in rare cases, may even be associative.82 ,100 ,118–120 ,183 On-site personnel must understand that oral fluid intake, and intravenous fluid infusion of hypotonic and isotonic fluids, are contraindicated in all suspected cases of EAH and rapid transfer to a hospital is necessary. The potential life-saving role of HTS requires wide-spread education and should be considered the equivalent of automatic external defibrillators and ice/cold water immersion in the ‘first aid’ of sudden cardiac arrest and exertional heat stroke, respectively. Team physicians and medical directors of athletic events should be involved in all decisions regarding medical management, including overseeing medical protocols, medical supplies/equipment, strategies for fluid replacement that optimise safe hydration practices, placement of fluid stations and the use of intravenous rehydration. Important athletic event decisions include spacing and placement of fluid stations, distribution of fluid replacement advice to athletes, and training of the aid station personnel and spectators. Drinking advice distributed to participants by sponsors should be reviewed by and approved by the event medical team to avoid conflict with the official race educational information. Team physicians and event medical directors should ideally have onsite point of care [Na+] analysis available and HTS on hand for management of EAH and EAHE. The event organiser/medical director should be in contact with the local emergency medical services to ensure that transportation to an advanced care medical facility is available during events with high risk for EAH (see box 1). A record of EAH cases should be kept, including follow-up and outcome, to aid in planning for future events, and to establish both incidence and prevalence for different events. Prior to the race or athletic event, the medical team should establish a relationship with the local emergency response and transport teams, medical facilities and emergency department physicians. This may include specific collaborative education programmes aimed at all of these groups and pre-event checklists to ensure that the appropriate course of action is taken, and the needed supplies are available in the emergency room when an athlete arrives in extremis. Summary statement: Prevention of EAH requires broad educational programmes with consistent messages that stress the importance of appropriate hydration practices, recognition of EAH and proper therapy (Grade 1C). There are three distinct groups of athletes that demonstrate extreme sodium conservation, which may increase the susceptibility towards the development of hypovolaemic hyponatraemia: (1) runners participating in 161 km races under hot conditions;139 (2) Ironman triathletes participating in hot and humid Ironman triathlons19 ,20 and (3) football players during the first week of training camp.188 These three groups would hypothetically be at greater risk for developing the hypovolaemic variant of EAH from more vigorous and sustained sweating (and associated sweat sodium and potassium losses), coupled with an inability to eat sufficient foods to offset the sodium and potassium losses. Football players may also lack adequate adaptations to heat stress at the onset of pre-season training, which would prevent excessive sweat sodium losses with repeated exposure. Treatment of hypovolaemic hyponatraemia: Participants with suspected hypovolaemic EAH and developing signs of encephalopathy would be best treated initially with an intravenous HTS bolus to reverse intracerebral oedema and expand the intravascular volume. The initial bolus of HTS can be followed by intravenous 0.9% saline, if neurological symptoms improve. At least one panel member has successfully treated athletes who were clinically volume depleted, with measures of [Na+] as low as 124 mmol/L, with intravenous normal saline infusion. As in all cases of EAH, it would be harmful to treat with hypotonic intravenous solutions. The clinical relevance of the asymptomatic form of EAH continues to be disputed. We agree that the main clinical relevance of asymptomatic EAH lies in the potential for asymptomatic athletes to transition to symptomatic EAH with the continued ingestion of hypotonic fluids.36 ,120 Moreover, symptomatic EAH can rapidly progress to life-threatening symptomatic hyponatraemia if large volumes of hypotonic fluids are ingested after identification of asymptomatic EAH,82 or are administered intravenously134 during recovery from exercise. Examining tolerance versus risk for various forms (tablets vs solution) and amounts of sodium supplementation on health, performance and natraemia status. Gathering evidence with regard to the success of the ‘drink to thirst’ strategy on prevention and/or reduction of the incidence of EAH in athletic events. Identifying genetic markers that may predispose individuals in developing EAH. Investigating the efficacy of alternative treatments for non-life-threatening EAH, including oral hypertonic sodium solutions, sodium tablets and vasopressin receptor antagonists. Clarifying the aetiology behind the apparent hypovolaemic variant of EAH and the potential for pathophysiological consequences. The primary aetiology and pathophysiological mechanism underlying EAH—and all known fatalities—is the overconsumption of hypotonic fluids relative to exchangeable sodium in likely combination with non-osmotic AVP secretion (Grade 1A). Under-replaced sodium losses contribute to serum [Na+] independent of distance (Grade 1A). However, there is a paucity of data supporting sodium loss as the primary mechanism of symptomatic EAH even in those who exercise for prolonged periods of time and in warm weather (Grade 2C). In these cases, relative overdrinking of hypotonic fluids with sustained non-osmotic AVP secretion is likely involved in the development of symptomatic EAH. EAH can present with a wide range of symptoms ranging from non-specific mild symptoms to severe encephalopathy. The severity of symptoms and not the absolute value of the [Na+] should guide the choice of therapy (Grade 1A). Rapid determination of [Na+] is critical in confirming clinical suspicion but may not always be available. The major clinical relevance of asymptomatic EAH lies in its potential for asymptomatic athletes to quickly transition progression into symptomatic stages if hypotonic fluids are given intravenously or ingested (Grade 1C). Thus, in patients identified with EAH, hypotonic or isotonic fluids should be withheld until urination is documented (Grade 1C). For those athletes presenting with signs and symptoms consistent with EAHE, emergent intravenous treatment therapy with HTS is indicated and should not be delayed pending laboratory measurement or other diagnostic testing (Grade 1B). Athletes presenting with mild symptoms associated with EAH can be treated with an intravenous bolus of HTS (Grade 1B), oral HTS fluids or observation until the onset of urination, as dictated by clinical symptoms (Grade 2B). Given that excessive fluid consumption is a primary aetiological factor in EAH, using the innate thirst mechanism to guide fluid consumption is a strategy that should limit drinking in excess and developing hyponatraemia, while providing sufficient fluid to prevent excessive dehydration (Grade 1C). Prevention of EAH requires broad educational programmes with consistent messages that stress the importance of appropriate hydration practices, recognition of EAH and proper therapy (Grade 1C).
. Hyponatremia in a cold weather ultraendurance race. Alaska Med 2002;4:51–5.
. Changes in serum electrolyte levels during marathon running. S Afr Med J 1978;53:449–53.
. Serum electrolyte changes after marathon running. J Appl Physiol 1970;29:449–51.
. Fluid and electrolyte balance during the Comrades Marathon. S Afr Med J 1971;45:147–50.
. Hyponatremia induced by exercise: a 24-hour endurance March study. Miner Electrolyte Metab 1991;17:315–20.
. Seizure after exercise in the heat. Physician Sports Med 2000;28:61–7.
. Death from hyponatremia as a result of acute water intoxication in an army basic trainee. Mil Med 1999;164:234–8.
. Hyponatremia in a marathoner. Physician Sports Med 1988;16:78–87.
. Pulmonary oedema and hyponatraemia after an Ironman triathlon. BMJ Case Rep 2009;2009:bcr04.2009.1764doi:10.1136/bcr.04.2009.1764.
. Overdrinking-induced hyponatraemia in the 2007 London Marathon. BMJ Case Rep 2009;2009:bcr09.2008.1002doi:10.1136/bcr.09.2008.1002.
. Encephalopathy due to severe hyponatremia in an ultramarathon runner. West J Med 1993;159:188–9.
. Hyponatremia in the 2009 161-km Western States Endurance Run. Int J Sports Physiol Perform 2012;7:6–10.
. Hyponatremia in marathon runners due to inappropriate arginine vasopressin secretion. Am J Med 2007;120:461.e11–467.e17.
. Preps sports report. The Clarion-Ledger, 2014. http://www.clarionledger.com/story/prepsreport/2014/08/25/walker-wilbanks-cause-of-death-related-to-over-hydration/14598215/ (accessed 28 Apr 2015).
. Update: Douglas County football player has died. The Atlanta Journal-Constitution 14 A.D. 11 August 2015. http://www.ajc.com/news/news/family-douglas-county-football-player-has-no-brain/ngy2X/ (accessed 28 Apr 2015). Sydney Morning Herald. Bushwalker died from drinking too much water. Sydney Morning Herald, 2012. http://www.smh.com.au/national/bushwalker-died-from-drinking-too-much-water-20120917-2621c.html (accessed 28 Apr 2015).
. Au Sable River Canoe Marathon pushes paddlers to the limits. The Bay City Times, MLive.com. 16 July 2009. http://www.mlive.com/sports/saginaw/index.ssf/2009/07/au_sable_river_canoe_marathon.html (accessed 28 Apr 2015).
. 8 Charged in Chico hazing death. SFGate. 4 March 2005. http://www.sfgate.com/cgi-bin/article.cgi?file=/c/a/2005/03/04/HAZING.TMP (accessed 28 Apr 2015).
. District officer dies after bike ride. Over-hydration cited as factor. Washington Post. 10 August 2005. http://www.washingtonpost.com/wp-dyn/content/article/2005/08/10/AR200508100146 (accessed 28 Apr 2015). Electrolyte Imbalance Blamed in Death of Football Player. Coroner's office says athlete failed to replenish lost sodium. TurnTo23.com. 29 August 2008. http://www.turnto23.com/print/17338293/detail.html (accessed 2 Sep 2008).
. Exercise-associated hyponatremia with exertional rhabdomyolysis: importance of proper treatment. Clin Nephrol 2015;83:235–42.
. Hyponatremia associated with overhydration in U.S. Army trainees. Mil Med 2001;166:405–10. Armed Forces Health Surveillance Center. Update: exertional hyponatremia, active component, U.S. Armed Forces, 1999–2013. MSRM 2014;21:18–21.
. Severe hyponatremia develops in a runner following a half-marathon. JAAPA 2008;21:27–9.
. Exercise associated hyponatraemia leading to tonic-clonic seizure. BMJ Case Rep 2012;2012:bcr0820114625.
. Exercise-associated hyponatremia. Proc (Bayl Univ Med Cent) 2007;20:398–401.
. Peak rates of diuresis in healthy humans during oral fluid overload. S Afr Med J 2001;91:852–7. Sports Dietitions Australia. Fact Sheet Sports Drinks. 20 April 2011. http://sportsdietitians.com.au/resources/upload/110616%20Sports%20Drinks.pdf (accessed 28 Apr 2105). Cystic Fibrosis Foundation Patient Registry. 2012 Annual Data Report. Bethesda, MD, 2012:1–32.
. Certified athletic trainers’ perceptions of exercise associated muscle cramps. J Sport Rehabil 2003;12:333–42.
. Evaluation of renal function and fluid homeostasis during recovery from exercise-induced hyponatremia. J Appl Physiol 1991;70:342–8.
. Urinary concentrating mechanism. In: Brenner B, ed. The kidney. London: W.B. Saunders, 2003.
. Body temperature modification of osmotically induced vasopressin secretion and thirst in humans. Am J Physiol 1995;269:R874–80.
. Avoid adding insult to injury—correct management of sick female endurance athletes. S Afr Med J 2012;102:927–30.
. Diagnostic value of urine sodium concentration in hyponatremia due to syndrome of inappropriate antidiuretic hormone secretion versus hypovolemia. Hawaii Med J 2010;69:264–7.
. Angiotensin, thirst, and sodium appetite. Physiol Rev 1998;78:583–686.
. The ‘Phantom Runner’. Phys Sportsmed 2004;32:32.
. A syndrome of renal sodium loss and hyponatremia probably resulting from inappropriate secretion of antidiuretic hormone. 1957. J Am Soc Nephrol 2001;12:2860–70.
. Death by water intoxication. Mil Med 2002;167:432–4.
. Fatal water intoxication of an Army trainee during urine drug testing. Mil Med 2002;167:435–7.
. Daily body mass variability and stability in active men undergoing exercise-heat stress. Int J Sport Nutr Exerc Metab 2004;14:532–40.
. Characteristics of those with exercise-associated hyponatremia after a 161-km run. Res Sports Med 2012;21:164–75.
. Thermal and circulatory responses during exercise: effects of hypohydration, dehydration, and water intake. J Appl Physiol 1997;82:2028–35.
. Hormones and behavior. Vol. 76. American Scientist, 1988:261–7.
. Sodium-free fluid ingestion decreases plasma sodium during exercise in the heat. J Appl Physiol 1999;86:1847–51.
. Rectal temperatures, weight losses, and sweat rates in marathon running. J Appl Physiol 1967;23:347–52.
. Exercise-associated hyponatremic encephalopathy and exertional heatstroke in a soldier: high rates of fluid intake during exercise caused rather than prevented a fatal outcome. Phys Sportsmed 2015;43:93–8.
. Whole body sweat collection in humans: an improved method with preliminary data on electrolyte content. J Appl Physiol 1997;82:336–41.
. Complications of fluid overload in heat casualty prevention during field training. Mil Med 1998;163:789–91. Contributors TH-B, SF-G and MHR initiated and planned the consensus meeting. MHR chaired the workgroups and closed panel deliberations. JPD, WOR, TH-B, JGV and RJM served as workgroup chairs. All the authors drafted, revised and approved multiple drafts leading to the final document. Competing interests RJM has received research funding and consulting fees from the food and beverage industry. He is currently Chair of the Science Advisory Board of the European Hydration Institute.